A number of Youth Groups drawn across the continent with support from some civil society organisations have impressed on African governments to stop the lip-service and take immediate action on climate change. They peacefully marched through some principal streets of Accra to the Accra International Conference Centre (AICC) where government leaders and policy makers were engaged in the Africa Climate Week discussions on Thursday. Holding placards with many inscriptions, their message was that there have been so much talks already and the time for Climate Action is now. 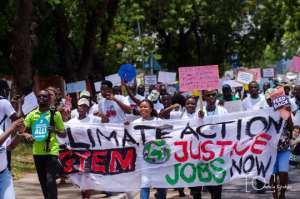 Ghana Youth Environmental Movement (GYEM), 350 Ghana, and Green Africa Youth Organization (GAYO) led the march which was dubbed, "Power Shift." These groups were led by Richard Pomeyie, Newton Abubakar Zico, Portia Adu Mensa and Joshua Amponsem. Upon arrival at the conference centre, Richard Pomeyie, Coordinator of GYEM read the petition on behalf of the group. He called for climate justice and the provision of green jobs among other things. “The young people have realised it is upon them to defend the future and the future of the future generations,” he said. Joshua Amponsem of GAYO, added that “it is urgent for governments to commence action on Climate Adaptation and increase youth involvement in climate action processes from the national to the community level. We have seen and heard of diverse strategies, it is about time we see effective and accountable implementation of climate policies”. Pan African Climate Justice Alliance (PACJA), a continental coalition of civil society organisations that mobilises civil society organisation led the Africa group. The African group who were part of the march held the banner that projected the Inter-Generational Equity and Role of the Youth in the Implementation of Nationally Determined Contributions. Ann Kobia, Human Resource and Administration Officer, Pan African Climate Justice Alliance (PACJA), said that it is important for the voice of the youth to be heard. “We want the voice of the civil society and the youth heard, because this the generation we are saving the planet for that is why we are keen on incorporating the voices of the youth in everything we are doing." The message from the Peasant Farmers Association of Ghana (PFAG) led by the Pascal Kudiabor, asked leaders to stop the use of agrochemicals and employ agro-ecology practices. Philip Jakpor, Head of Media and Campaigns, Environmental Rights Action/Friends of the Earth Nigeria (ERA/FoEN), said that industrial agriculture must be replaced with agro-ecology. "Since the beginning of the Africa Climate Week we have been witnesses to how the fossil fuel industry trade associations and their allies tried to steer the discussions away from the real solutions. We stand with farmers and other groups advocating agro-ecology in place of industrial agriculture which contributes to climate change". In support, Director for Vision for Alternative Development, Ghana, Labram Musah, emphasised that agro-ecology will protect livelihoods of indigenous people. "The solution to climate change is within the realm of non-market mechanisms and pro-people initiatives. Agro-ecology will not only tackle climate change but will also ensure that local livelihoods are protected". National Coordinator for 350-Ghana Reducing Our Carbon (G-ROC), Portia Adu Mensah, on her side was worried that after the signing of the Paris Climate Agreement; little seems to have been done to address the emissions in signatory countries. “Action starts now, because we sign the Paris Agreement and we don’t follow them, we allow a lot of things to happen to our climate so we are here to let them know that the youth are ready to stand for the change and we want the change now”. Meanwhile, Executive Director of PACJA, Mithika Mwenda, admonished the youth groups to keep the pressure on their governments until they see the necessary actions taken. Africa Youth Initiative on Climate Change (AYICC) from Zimbabwe was part of the Africa Group that represented in the march. Mr Mwenda encouraged them to keep the fire on adding that, PACJA will support them with its allies. This ACW is part of the series of the decentralised actions of climate actions in the world under the UNFCCC and an avenue that the groups felt important to channel their message. Others groups which were present are the Agro-ecological Movement and the Centre for Indigenous Knowledge and Organisational Development (CIKOD).